What It’s About: Bunny Watson (Katherine Hepburn) runs the research department of a major broadcasting network. Richard Sumner (Spencer Tracy) is an efficiency expert and computer designer who starts spending time in the research department monitoring them. The two begin to hit it off, but there are just two problems: Watson believes Sumner is there to replace her staff with a computer, and Watson is rising executive Mike Cutler’s (Gig Young) sort of girlfriend. Why Watch it Today? 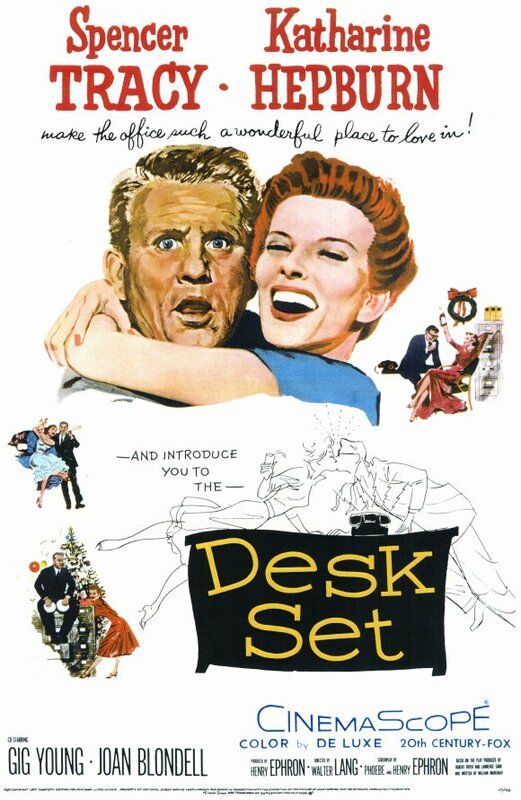 : It’s National Library Week, so celebrate by watching this film which, although dated, is a favorite of many in the profession. Of course, the idea that computers and librarians are like oil and water is dangerous and unfortunately still in circulation, and librarians are best at looking up information, not simply knowing it off the top of their heads like Bunny, but this is not a documentary! This entry was posted in Based on a Play, Comedy, Movie of the Day, Romance, Screwball, Workplace and tagged 20th Century Fox, evil computer, Gig Young, Henry Ephron, Joan Blondell, Katherine Hepburn, librarian, library, Phoebe Ephron, Spencer Tracy, Walter Lang, William Marchant. I caught part of this on TV years ago and have had it in the back of my mind to see the whole thing since then. Still haven’t done it. Probably not happening on April 10th either. Maybe I’ll schedule it for 4/10/12. Ah, but Eric, it’s Library Week all week-so you have seven days! I wish my name were Bunny, so so much. I’m not sure I want to be called Bunny, but I’d love her all encompassing mind. Jenny is a pretty good name to have though-you get better songs than I do (Timothy, the only one I know of is about a guy who gets eaten by his fellow miners when they’re caved in!